Hwy all! Been working hard this week. Took a short break on Wednesday to just relax because the both of us forgot that it was our 9th wedding anniversary until about dinner time. After that, I finished both of September’s wallpapers, one of which has a NSFW version for $10 patrons. They’ll both be up some time next week for patrons, but there’s a preview below. After that, I had to re-thumbnail the next batch of pages because of a small change we made to them–the scene that happens next was about a page and a half in my original thumbnails, but there was no way that Cory’s rough script was going to be able to fit into them. The chapter is now going to be slightly longer, but also more clear, so there’s that. My plan for the Friday is to make sure I have the next batch entirely sketched so that I can spend Saturday inking it, as well as a couple of pages from the part of book two that needs to be redrawn for print. 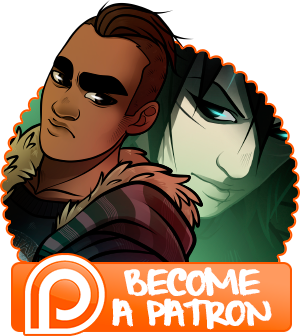 Flats start on Sunday, colours start Monday, and we should be on track for Friday’s update. Anyhow, enjoy your Labour Day weekend everyone! Cheers!